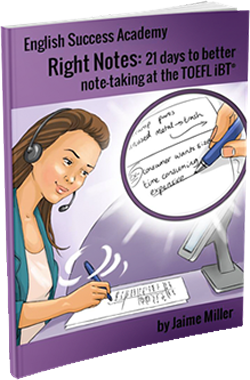 TOEFL Right Notes: IMPROVE 4 SKILLS AT THE SAME TIME! TOEFL Right Notes: IMPROVE 4 SKILLS AT THE SAME TIME! IMPROVE 4 SKILLS FOR TOEFL iBT AT THE SAME TIME! We help you get better at note-taking, listening, speaking & writing in 21 days. It improves your ability to take notes by helping you develop a personal code and abbreviation system, and then giving you a lot of practice. You get daily practice listening to topics that come up at TOEFL iBT’s listening and speaking section. Of the 21 days of topics, there are 17 academic lectures and 4 campus conversations. Each day, you have a listening, speaking and writing activity — so if you need to improve your TOEFL listening, writing or speaking score (specifically for Task 4 or 6), then you will get 21 days of practice. … who have trouble listening to academic topics and taking notes. … who need extra confidence to speak and write regularly about “tricky” academic topics. What’s the best way to study with Right Notes? Log into English Success Academy’s special website, the Online TOEFL Workshop. Watch the video on this page to see how to use it. Watch each day’s lesson, listen to audio files, and do speaking and writing practice. Then, compare your answers with the model answer from a real student who scored 27 on TOEFL speaking and 29 on TOEFL writing. – We recommend you spend 45 to 90 minutes a day for each of the 21 days. – For each day’s activity, you can see a sample answer that was done by a real TOEFL iBT student who got 27 on speaking. – All audio files were recorded by native-speakers of English. “I’m so happy and shocked! My first speaking score was 23 and I thought I wouldn’t be able to get the score that I wanted because I had no idea where to start and what to do to improve. My latest speaking score is 27! Right Notes helped me to address my weak points and to deal with them.” Heidi, a Filipino Nurse, also got Score Analysis & used Advanced Speaking Guide.